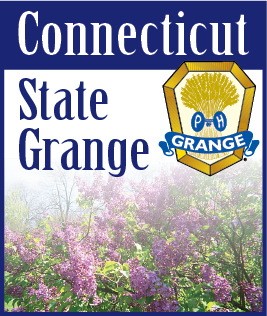 I know many of you are upset with the delivery of the January issue of the Connecticut Granger. I assure you that I am as well. Unfortunately, the weather was “Strike One” in a series of issues that caused the problem this month. The issue was scheduled for printing New Year’s week. As you know, we had a snowstorm that week that was even stronger in eastern Massachusetts, where the Granger is printed. “Strike Two” was a comedy of errors on the part of the printer in delivering the paper to Torrington where I pick it up. It was scheduled for delivery a couple of times and not delivered and/or forgotten. When it finally arrived, it was already a week behind schedule. After a day or two for me to process it for printing, it was delivered to the Winsted Post Office for delivery… yep, “Strike Three.” For some inexplicable reason, the paper was delivered to some of our members in a day or two, while others took an additional week, while still others didn’t receive it until an incredible date of Jan. 26! All I can say is I’m sorry for this, I’m not sure how this could have been avoided as I stuck to the schedule I follow each month. It just fell apart from the moment it left my hands until it returned to me and then again when it left my hands again to the Post Office. Hopefully you are reading this issue in the early part of February and all is well again. In other news, the annual billing for the Granger subscriptions went out to all Granges in early January. We have started to receive lists and payments from Granges. I thank you for your patience as it has been incredibly difficult to get this out this year due to the many different Grange issues demanding my time this year. Don’t be surprised if late December/early January becomes the new billing time for the Granger. It seems to make more sense to do this away from the hectic pace of preparing for State Session. We will see as October gets closer! We would love to see more of our Community Granges reporting in each issue. Your reports don’t have to be much more than a brief mention of your upcoming schedule and a few notes about what is going on in your Grange. It can be more than that if you wish as well. Please let me know if you need more information about Connecticut Granger reporting. To our new Pomonas… I hope to hear from three new Correspondents from each of them in the coming issues. We know that two of the new Pomonas are well on their way and the third is progressing.